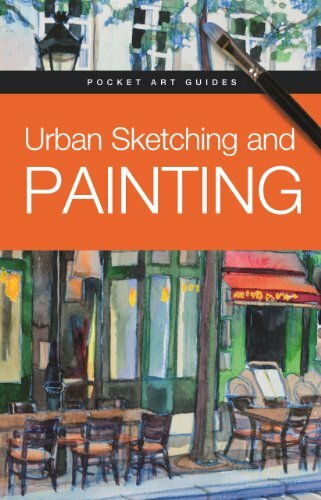 Urban Sketching and Painting from publisher Barron's is a book of quick tips and simple techniques on drawing in the urban setting, around cities, towns, gardens, etc. The book is just slightly smaller than A5 size and has only 96 pages. The drawing tips are quite helpful at times but you should already know how to draw to get most out of the tips, to apply them when drawing urban areas. The tips talk about things you should note, such as the use of perspective to get a more accurate drawing, paying attention to selected subjects instead of drawing in the whole scene, how to use people to make your drawing more dynamic, etc. There are several step-by-step tutorials but those are meant to show you the process rather than to have you follow along because the examples are quite detailed to replicate. You can use the same process for your own artworks. These tutorials use a variety of mediums such as oils, watercolour, pastels or even collage. Occasionally, past artists are mentioned and the tutorials attempt to paint a modern scene in the style of that artist. Overall, the tips are pretty straightforward. If already you know the basic foundations of drawing, you can pretty much use that knowledge to draw in any setting. This book just provides you with the additional tips in the urban context. The book's alright, just that I prefer books that are more detailed even if they are going to be slightly more expensive. I've reviewed quite a few other urban sketching books that are more detailed and insightful such as The Urban Sketching Handbook: Architecture and Cityscapes, Urban Sketching: The Complete Guide to Techniques, Sketching on Location or Freehand Drawing and Discovery.